Here's how to set a caller id image on your DuraForce PRO. Here's how to turn HD Voice video calling for your DuraForce PRO on or off. Learn how to make an HD Voice call for a clearer, more natural sound using your Kyocera DuraForce PRO. 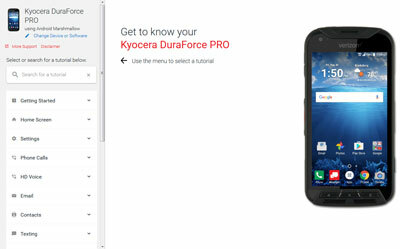 An interactive guide on how to make a video call to a contact with HD Voice using your Kyocera DuraForce PRO. See how to turn VoLTE Calling on and off for your Kyocera DuraForce PRO. Here's how to manage emergency alerts (e.g., AMBER Alerts, etc.) for your DuraForce PRO.